As the experience of IML is now behind me, and as my title year draws to a close, I am left reflecting on my journey and the many amazing experiences I have enjoyed. Representing my club as the first Australian competitor at the International Mr Bootblack Competition is truly one of the most memorable. Although I did not figure in the final places, I returned home having achieved more than what I had intended for my goal for the competition was not to win, but to acquire new skills and knowledge, and to to come home a better bootblack by submersing myself in in the bootblacking and leather cultures. 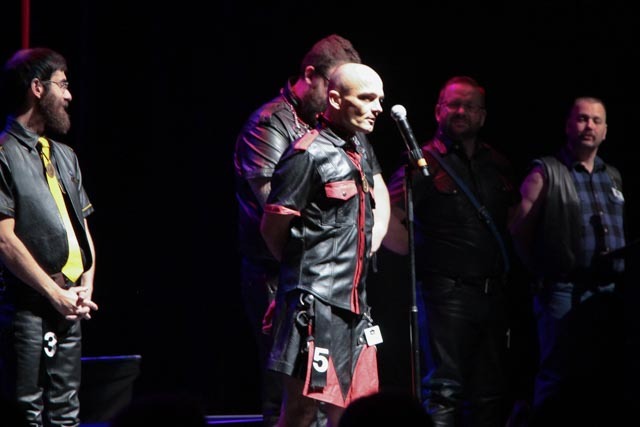 It was also important that I demonstrated the very qualities that I as a bootblack, and we all as leatherman aspire to so I was both humbled and honoured to receive the Brotherhood Award, as voted for by my peers. In the process of a lot of fun and much hard work we had the opportunity to forge connections with some amazing people, and had the honour of being introduced to some of the pillars of the leather community in the United States. My experience at IML was made even more special by being able to share my experience with a member of my chosen leather family. It would have been impossible to feel anything but pride as you heard the roar of the audience as Maximus lead out the competitors on the last night of competition flying the Australian Flag and wearing the BootCo. vest. Unless experiencing the competition first hand as a competitor or handler, it is difficult to appreciate the amount of work competing involves. The effort Maximus placed in both preparing and competing was nothing short of exemplary. You will hear me take some liberty in teasing Maximus about being a star, but I am not exaggerating. It seemed everybody either knew or knew of Maximus and BootCo even before we arrived. Our club could not of been represented by a finer competitor. Although it was both Maximus and I competing, there was a third person representing BootCo. on the international stage; our President, Anthony Smith. Although my Sir travelled with me as my Carer, it was only when we arrived and we understood what was involved did we appreciate the importance of the handler role. For the entirety of the three days of competition our President worked almost as hard as i did to ensure that all I had to do was concern myself with the boots before me and to absorb as much of the experience as possible. As a handler, my Sir ensured that I was eating, staying hydrated, taking adequate breaks, organising my client list, to tending to the cuts on my fingers caused by a marathon 20 hours of bootblacking and then being their for me to debrief at the end of each day. Even more humbling is the fact that this was made possible by the support and generosity of many people from our community, our club or the Committee. This was a noted difference between my competitors experience with their clubs and my own. So many people played a role in getting me to the competition that if I listed them separately I would be sure to miss somebody, but I want to take this opportunity to thank everyone of you. I do need to make a notable thank you to my Sir, because without his willingness to travel with me and support as my Carer I would have been unable to compete. Being my Carer, my companion, my handler and my Sir was challenging at times for the both of us, and I have never lost sight of the extraordinary commitment this took. Although we had to keep pinching ourselves that we were actually there and that it was rather surreal at times there was a note of sadness for the both of us, because it would, as an important element was missing; our respective partners. To this end I need to thank my pup for his support throughout the whole experience, and encouraging me to continue with my travel plans even when we found out that it was not going to be possible for him to join us. It was so difficult for me to say goodbye to my pup at the airport, so I could only imagine how difficult it was for the pup knowing that he could not be there to support me and to enjoy this experience together. The good news that I can share with you is that within a week of our return pup’s visa was approved. It was bitter sweet but at least my pup will be able to join me when I compete in 2016. Finally, there is one person that I probably need to thank most of all; and that is my Sir’s husband, Kobi. Without his support, encouragement and trust I would not of had the opportunity to enjoy this experience. It is not lost on me how difficult it must have been to know that he was also not able to join his husband. My trip was made possible with the support and generosity of so many people. So many people had showed their generosity and support. My IML experience is a treasured memory and serves well as a book-end to my title year. It was a title that I did not expect to win. It was a title that initially came with nothing more than a trophy and a month of men pass from 29. The title came with no real expectation, but it came with immense privilege in that it provided me with a platform on which to be heard and seen. It provided me a vehicle in which I could connect with people. I recall uttering in my speech on stage that it was the structure, strictness and stability of a leatherboy lifestyle offers that I sought the most and it is what has been most useful to me in my journey. From my viewpoint, the title of leatherboy did come with one major responsibility, and that was to walk my own journey and to speak my own truth, whilst always fostering the courage and voice within others as all to often we are eager to mediate on another people’s journey and speak on their behalf as to know their truth. To say that the previous 12 months has been any thing less than dynamic would be an understatement. There has been massive change not only physically, emotionally, mentally and geographically but also in relationships. I even received a new name! I am conscious that without my title I may not of come to be introduced to bootblacking by my Sir and would not of enjoyed the immense joy and opportunities that followed, including becoming our club’s resident bootblack. But by far the greatest gift my title has afforded me is my chosen leather family. I am deeply grateful for their continued love and support. It nourishes me and wills me to become the best that I can be. I am just so thankful that they came into my life when I was most ready to receive them.